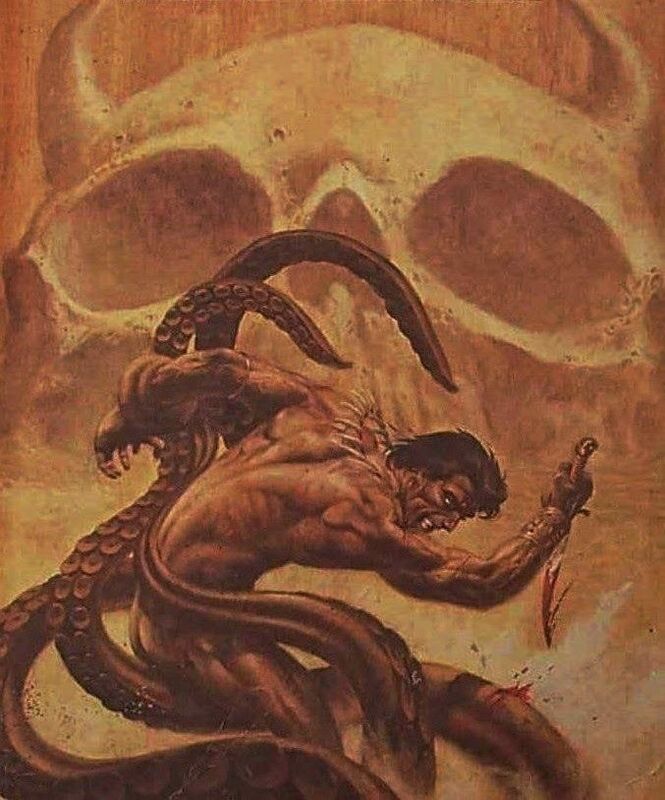 Paul R. McNamee’s short stories have appeared in various publications, including the sword-&-sorcery anthology, THE MIGHTY WARRIORS, and the action adventure magazine, STORYHACK. John Jakes--known later for his historical fiction novels--started his writing career submitting short stories to magazines in the 1950s and 1960s. Sword-&-sorcery fans might be familiar with his ‘Clonan’ character, Brak the Barbarian. In 1970 and 1972, Jakes produced a duo of planetary adventure novels; MASTER OF THE DARK GATE and WITCH OF THE DARK GATE. MASTER OF THE DARK GATE, graced with cover art from Jim Steranko, tells of Gavin Black’s adventures on alternate Earths. Black is an ex-Green Beret who lost part of his leg in Vietnam leaving him with a prosthetic and a limp. At the story’s beginning, Black works as newspaper reporter, covering protests and unrest in Washington, D.C.
Black notes something strange about some of the ‘police’ in riot gear, and the men attack Black as the protests become a riot. Black is rescued by a strange old man, Bronwyn. Bronwyn lives in a D.C. hovel with his daughter, Helanne. Bronwyn tells Black of the Klekton--the rings of alternate Earths which revolve around Earth. Bronwyn is from Earth Prime. Black’s strange attackers were from Earth Three. The despot of Earth Three plans to attack Earth. Bronwyn wants Black to travel to Earth Three to set an explosive in the interdimensional gate. Bronwyn won’t go himself, because Earth Primers believe they are above such physical action. Primers believe that if anything catastrophic happens to Earth, all the alternate Earths of the Klekton will be destroyed. It would all seem to be the ravings of a mad man--except that Bronwyn has replaced Black’s prosthetic leg with one of a higher grade and technology. The artificial limb is made of metal, but it is a perfect match visually, and has compartments for storage. Black no longer walks with a limp. Despite the leg, Black refuses to be an agent for Bronwyn--there is something deceitful about the old man. Returning home, Black learns his girlfriend, Sam, is an agent of Earth Three. She tries to kill him. He defends himself and renders her unconscious. Reluctantly, Black accepts the job from Bronwyn. Traveling to a specific geographical site, Bronwyn uses his Earth Prime mental power to open the gate. Still not trusting Bronwyn, Black grabs Helanne as insurance as the gate pulls him to Earth Three. The duo arrives on Earth Three, in the left eye socket of the skull-shaped island, Sea Wake. The right socket contains a gateway to yet another Earth--Earth Four. It’s not long before Helanne and Black are outmaneuvered, captured, and brought before the tyrant of Earth Three. Tarn Redboots is a lecherous, incestuous pederast of a villain. Sam, it is revealed, is no mere agent--she is Redboots’ sister, Tarianna. Tarn decides to play the most dangerous game, hunting Black. He turns Helanne and Black loose on a wild continent with a head start. Black befriends a native named Doggo. Escaping and returning to Sea Wake, the trio end up falling through the right eye socket and onto Earth Four. On Earth Four, they find a race of people even more primitive than Doggo. Black is unable to prevent the natives from tossing Helanne into a volcanic pit as a sacrifice to their gods. Pursued by Tarn and joined by Sam, there are captures and escapes until the final showdown, where Black succeeds in destroying the gate and killing Tarn. Black is pulled through the gate as it is destroyed and returns to Earth. He does not know the fates of Sam or Doggo but assumes them to have been killed. Black and Bronwyn part company on unfriendly terms. WITCH OF THE DARK GATE, with cover art by Frank Frazetta, picks up two years later. Exiled back to Earth, forlorn over the loss of Sam (Tarianna,) and unable to forget or tell anyone about the Klekton, Black has sunk into alcoholism. He loses reporting gig after reporting gig and is running out of money. Bronwyn leaves a calling card and Black seeks him out. Bronwyn is convinced Helanne is still alive on Earth Four. Black only saw her thrown into a volcanic pit, he did not witness her death first-hand. Bronwyn wants to travel to Earth Four personally, and he wants Black to assist. If Black will cooperate, and they recover Helanne, Bronwyn will open a gate to Earth Three so that Black can attempt to rescue Sam. Not trusting Bronwyn but having no better option, Black agrees to the mission. Black’s return to Earth Four finds him further south than his previous visit. Here there are civilized cities--and an invading army from Earth Three. The fight for succession of Tarn Redboots is over. Earth Three’s new despot again has evil plans for Earth. But first he needs resources from Earth Four. The new leader, Eljer, is a blind telepath with strong metal powers--stronger than Bronwyn or perhaps anyone from Earth Prime. Aided by Jina, a soldier who is s friend of Sam’s, and by Doggo--who now is employed in the Earth Three military--Black and Bronwyn escape the clutches of Eljer and flee further south. They take refuge in the city of Shaz, where they learn the Veiled Lady, a witch, holds some sway over the people. The Veiled Lady is none other than Helanne, who had not died in the pit but had caught on a ledge and survived. Fortunes reverse on Black when Bronwyn betrays him, snatching Helanne and opening a gate, abandoning Black. Black flees the city and watches from a distance as Shaz falls to Eljer days later. Jina and Doggo join Black. Jina also has mental powers but Eljer blocks her from opening a gate to escape. Black, desperate to move on to Earth Three and find Sam, decides they must assassinate Eljer. Using Jina’s mental power to gain control of the giant Gol, the trio rallies the populace of Shaz to attack Eljer’s soldiers. Eventually, Black and Eljer duel and Black wins. Jina attempts to open a gate, but she is kept behind and Black is pulled to Earth--not Earth Three. The story ends with Black desperate to find a gateway and wondering when the invasion plans of Earth Three will finally come to fruition. It’s open-ended enough for another in the series but Jakes never published one. I found MASTER OF THE BLACK GATE to be a serviceable story. I like the setup and execution. Jakes doesn’t flinch from violence when needed. Doggo is a fun supporting character. I do think Tarn Redboots’ utter decadence is a bit over-the-top. I never really accepted Black’s infatuation with Sam. She never comes across as, say, a Dejah Thoris. And the Tarn, Black, and Sam triangle is--frankly--a bit much and more uncomfortable than needed. WITCH OF THE DARK GATE is the more enjoyable novel for me. It has a straighter thruline and a more interesting villain. With the concept and backstory already fleshed out in the first novel, WITCH gets underway at a nice clip. Black has an all too brief reunion with Doggo. Jina is a more captivating character than Sam, though she is not a romantic interest for Black. The giant Gol smashes around as well as any monster should. Bronwyn is present for most of the story--for better or worse, in Black’s case. The constant treachery of Bronwyn puts a nice untrustworthy angle on the “wise old man” character. Despite the fact these are ‘old school’ short novels, Jakes packed them well. They didn’t change the face of planetary adventure any more than Brak changed sword-&-sorcery. But they fulfill the same role--adventure tales for a few hours of escapism when you want it.